Yadier Molina homered to right-center, a ball that bounced off the top of the wall and into the St. Louis bullpen. MILWAUKEE — Yadier Molina’s defense and longevity might earn him a ticket to the Hall of Fame. Suddenly the veteran St. Louis Cardinals catcher is on a home-run tear. 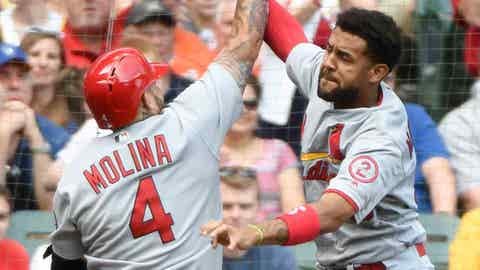 Molina’s two-run homer in the sixth inning off reliever Jeremy Jeffress gave St. Louis the lead and the Cardinals held on behind the solid pitching of Mikolas and four relievers. “He was such a young player when he came up,” Matheny said of Molina, who earlier this week set a major league record for most games caught with one team (now 1,762). Marcell Ozuna led off the sixth with a line-drive single to center and scored on Molina’s shot to right-center, a ball that bounced off the top of the wall and into the St. Louis bullpen for a 3-2 Cardinals lead. Brewers: Ryan Braun entered in the fifth inning to play left field, when outfielder Lorenzo Cain exited due to groin tightness. Cain also was hit by a pitch in the right elbow on Friday and hit by a pitch in the back in the first inning Saturday. Counsell said Cain would not play Sunday in the series finale. “He’s just a little beat up,” Counsell said. Braun appeared for the first time since receiving a cryogenic injection in his right thumb on Wednesday and went 1-for-2. . RHP Zach Davies (10-day DL, right rotator cuff inflammation) is scheduled to make a second rehab start for Colorado Springs on Sunday.